productivity with an enterprise level solution in a compact, easy to use form ideal for shipping/delivery operations. The new E430RT is built to withstand shock, dust, water, and 4-foot drops to concrete. 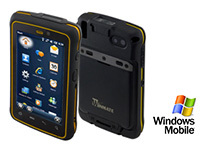 It features a 4.3" multi-touch screen is big enough to be user-friendly without being cumbersome. 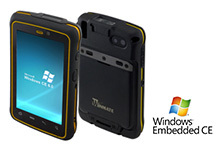 It also comes embedded with Windows CE 6.0, Handheld 6.5, GPS, and 3G offer faster routing, easy communication, increased productivity, and higher efficiency. 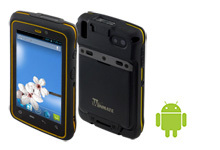 The E430RT can be securely mounted and charged in the vehicle with Winmate's new Pogo pin-style docking station. 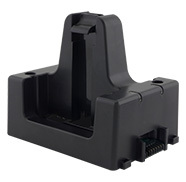 This quick-connect vehicle charging dock makes it easy to provide the user with distraction-free delivery route navigation while also allowing for fleet control optimization. 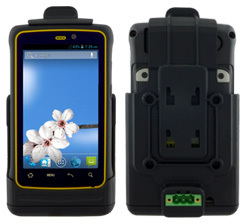 On-site, the quick-connect feature allows the user to disconnect quickly and get back on the job faster, improving productivity. The E430RT assists with delivery confirmation, load adjustments, invoicing, reports, and more. For users with greater power requirements, the dock also offers rapid charging to ensure uninterrupted workflow. 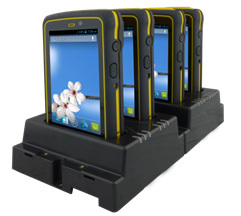 Other accessories include a 4-device 12v quick-charge dock and a 12v battery charger. The 12V power supply and 3 prong Pogo pin-style adapter provides a quick 2.5 hour charge - a noticeable upgrade from the traditional 5V USB cable. The 12V battery charger ensures a spare will always be ready eliminating the downtime associated with traditional chargers. Copyright 1996-2016 WinMate Communication INC. All Rights Reserved.